Disgruntled Minnesota Timberwolves star Jimmy Butler took part in the team’s practice session on Wednesday. In and of itself, that’s not a major story. It was noted that he’d be around as the All-Star awaits to be traded. 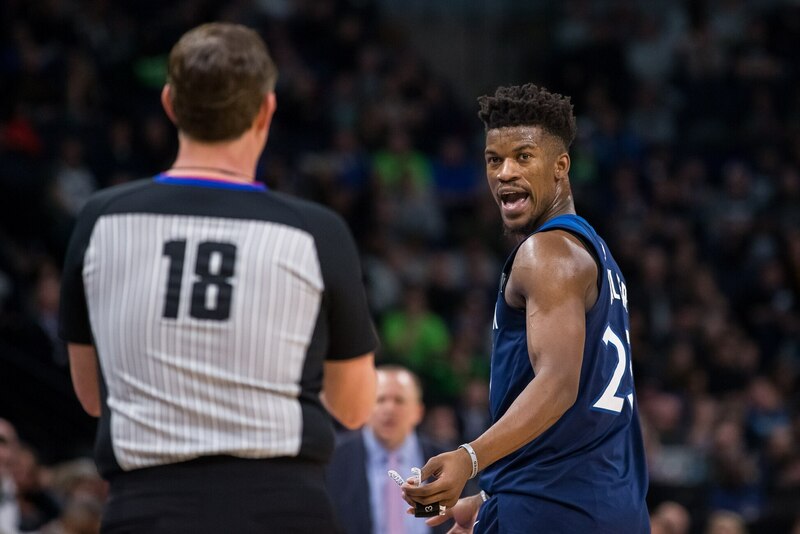 According to the report, Butler’s ire was directed at head coach Tom Thibodeau as well as teammates Karl-Anthony Towns and Andrew Wiggins, among others. All-Star Jimmy Butler participated in Minnesota's practice, a session that included him verbally challenging teammates, coaches and front office, league sources told ESPN. Butler was vociferous and emotional at times, targeting Thibodeau/Layden/Towns/Wiggins. Story soon on ESPN. The optics here are about as bad as it gets. Even prior to requesting a trade last month, Butler himself seemed to have an issue with both Towns and Wiggins. That’s now been taken to a whole new level that he’s demanded a trade from the team. In reality, Butler isn’t showing himself in the best of lights here. If his goal is to be traded, this display of immaturity isn’t going to help him. It’s bad optics. It’s a bad look And it lends credence to the idea that the All-NBA performer is a problem.